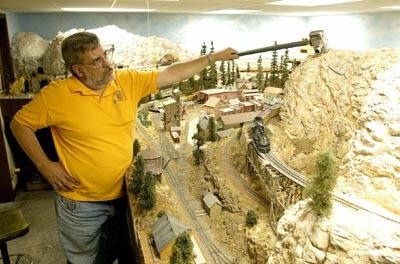 A few years ago, I wrote an article that appeared in, "Scale Rails," that featured taking, "aerial type," photos of your layout. This document will use several of the photos used in that article along with many others to show how photos from a different perspective can be accomplished. First off, try to imagine that you are floating high above your miniature world, looking over the terrain from the basket of a hot air balloon. 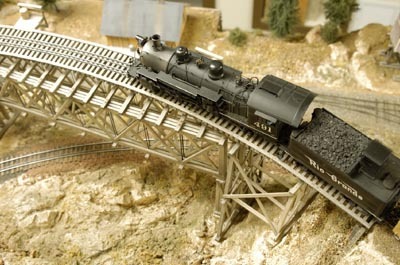 You're free to roam over parts of your layout that you never have seen from that perspective before. You could take, "aerial," photos using a ladder, but they're much easier if you use a device that's called a monopod. While a commercially produced one could be purchased for about $100 or so. I came up with one that's easy and inexpensive to make. large 1/4" x 20 wing nut. The total costs of these items shouldn't run you more than a couple of dollars. I was fortunate to find a nylon wing nut instead of a metal one. The "wings" of the nylon one were larger than those of the metal ones and will allow you to tighten it better. 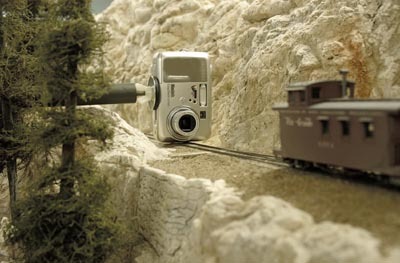 The purpose of all this hardware is to fasten a lightweight camera to the end of a wooden pole. 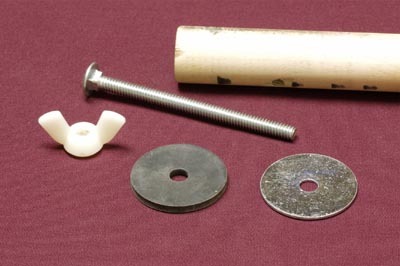 Use a hacksaw and cut the head off the machine screw or carriage bolt. Then file off any burrs that occurred because of the cutting. 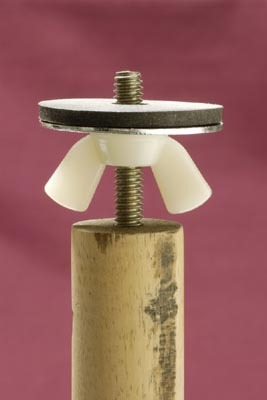 Thread the wing nut onto the other end, keeping the flat side of the nut pointed towards the uncut end, then slip the metal fender washer and rubber washer on the end of the bolt. Adjust the wind bolt until you have about 1/4" of the threads exposed. These will eventually be screwed into the bottom of your camera. 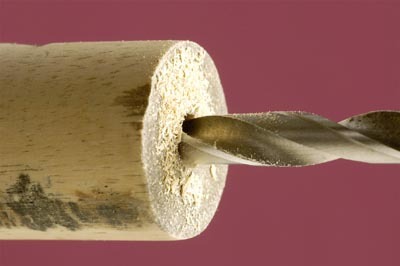 Carefully and slowly drill a 1/4" hole in one end of the dowel rod or broom stick. Make the hole deep enough so that the cut end of the bolt can only be slid in to a depth that still allows the wing nut to be turned and there's still 1/4" of threads exposed at the end. When you're happy with the depth of the hole, remove the wing nut and washers and set them near by. 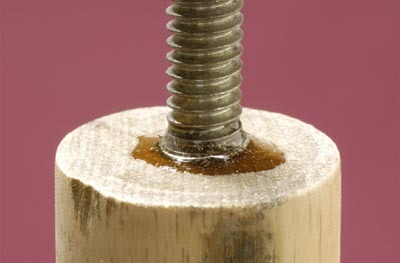 Mix up some "5-minute" Epoxy and drizzle it into the hole and also around the threads of the cut end of the bolt. Quickly press the bolt into the hole, turning it a bit to spread the epoxy thoroughly around the threads, then wipe off the excess with a rag. Then set the pole upright until the epoxy has hardened. When everything is hardened and set in place you can now sand off the pole and paint it to give it a more finished appearance. Tape over the threads so you don't get any paint on them. When it's dry, attach the camera. First, thread the wing nut back on the bolt, then the metal fender washer and the rubber washer so that there's about 1/4" of the threads showing. Hold your camera in one hand and slowly twist the pole until the threads are firmly seated in the camera. Don't make them too tight because you might damage the threads in the camera's base. 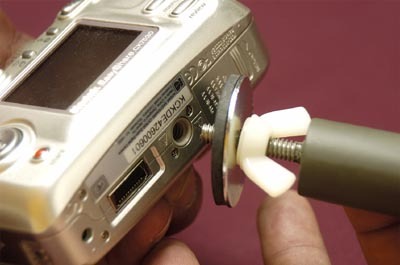 Tighten the wing nut and finger tight securely up against the bottom of your camera. The rubber washer prevents the metal washer from scratching the bottom of the camera and also keeps it from turning. The large wings on the nylon wing nut will allow you to easily twist it tight. Again, be careful not to over-tighten the wing nut because you could strip out its nylon threads. Now that you have your new camera mounted let's begin our, "hot air balloon flight. Many cameras now feature both built-in timers and auto-focus functions which we can use to our advantage. I usually set my timer to a 5 second delay and make sure the auto-focus feature is turned on. You still might want to use a step ladder or some sort to gain some additional height. Just make sure that you don't don't snag or hit anything with your body when you're holding the camera out over the layout. If you're using a digital camera, make a few test shots to check exposures and locate potential lighting and shadow problems, then review them on the camera's monitor. If everything looks fine, start shooting pictures as you "soar over the landscape". Allen Pollock, former NMRA President, came over to help me with the photos. While mentioned that besides holding the monopod device out over the layout, it could also be used to put the camera into areas that could not be easily reached by normal means. With that in mind, I took a few photos of him holding the camera at track level to obtain, "eye level" images from a perspective that would have been difficult to obtain with my larger camera. 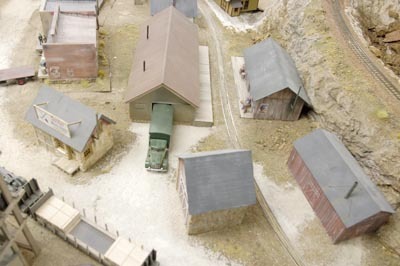 Taking photos of your layout from, "the hot air balloon," will probably reveal several things you have never noticed before, such as the detail, or lack of it, on the roofs of buildings. 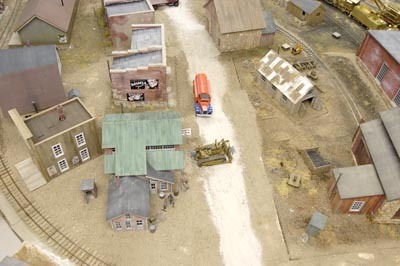 The greatest thing I liked after taking several of these aerial type photos was the new way I had of viewing my layout. Hopefully you'll make that same discovery.